A pendant beautifully carved with Laughing Buddha made of Jade. An auspicious symbols of Happiness and Abundance, wear this with you and let Laughing Buddha brings you joy and abundance of wealth! Popular Feng Shui recommended by Feng Shui Consultants. Laughing Buddha is popularly known as Happy Buddha or Lucky Buddha. 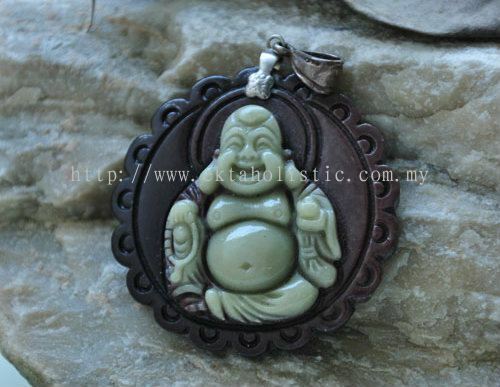 Laughing Buddha is an auspicious symbol of happiness, wealth and joy. Laughing Buddha is said to bring good luck & prosperity. His features graces many temples, restaurants and jewellery, and has come to represent a Buddha of Contentment and Abundance. He is always seen as carrying a bag which is always full with valuable items, represents fulfilment of wishes. Happiness is one of the Laughing Buddhas’s greatest gifts. Put a Laughing Buddha in raised position and treat him with respect. He will give you strength to move on, and strength to cope with stress. Highly popular Feng Shui Cure recommended by Feng Shui Consultant. Jade is the stone of Wealth & Abundance. It helps you to achieve all that you desire! It helps you to bring your dreams into reality, by making all things possible. It brings you good luck & wealth. Placing it in your office or money area will accentuate your flow of income. Jade symbolizes calmness and serenity. It helps to bring serenity to the mind by releasing negative thoughts and stress, and welcome positivity and harmony to the mind and body. It alleviates anxiety & fear based emotions. Jade provides excellent healing powers, especially for the heart and heart chakra. It vibrates in harmony with the Heart Chakra and open up the heart chakra to love energy. Physically, it is believed to help with the problems of kidney, heat, larynx, liver, spleen, thymus, thyroid, bladder, and even eyes. Jade also acts like a dream clarifier. It will help you to remember and understand your dreams better. It aids dream recall if placed under pillow.